When it is Good to Use Herbal Remedies for Dogs? Your dog is your best friend, and you do all that you can to take care of him and keep him in top shape. If your dog has issues and you want to avoid frequent trips to the veterinarian or animal hospital, it would be good for you to know when it is good to use herbal remedies for dogs. Whether you want to treat something specific or you want to help your dog stay healthy, there are herbs that can be very beneficial. You may want to use herbs to help reduce fleas and ticks, promote better digestive health, and improve overall health and vitality. Fleas and ticks are things that have always plagued dogs. Many people prefer to use herbal remedies so that they don't have to be near pesticides that can be harmful or toxic to both dogs and humans. Getting rid of the pests should not have to happen at the cost of poisoning the dog. Adding garlic on a daily basis or sulfur on a weekly basis can be very helpful in treating this problem. Dogs are often prone to digestive problems of one kind or another, particularly with diarrhea and constipation. Using herbal remedies for dogs is a good way to improve their digestive health. Probiotics are often helpful to dogs who have sensitive stomachs. For increased liver function, Milk Thistle with its flavenoids is often recommended. For overall health and an improved immune system, such herbs as Cat's Claw, Indian Ginseng, and Echinacea are all very popular. You may want to try these herbal remedies if your dog seems to have low energy, especially as he gets older. Many herbal supplements can actually improve his vigor and vitality. You may find that there are many supplements available in the pet section of your favorite store, so it may be hard to choose. Domesticated animals do not generally eat herbs to cleanse their systems like wild animals so, so it is up to you to provide them. It is actually a good idea to speak with your veterinarian about herbal remedies for dogs before simply beginning to use them. If you can find a practitioner who specializes in alternative medicines or remedies for pets, you can be assured that you will be on the right track. Using herbal remedies will also often reduce side effects that can occur with prescription medicines. By providing your dog with a healthy diet, plenty of physical exercise, and appropriate herbal remedies for dogs, you will be able to help him maintain his good health for many years to come. Rasean C Jirves is a freelancer writer and affiliate marketer. Visit Petsherbalhealthguides.com for Informative articles and tips on pet health problems, and homeopathic medicine and herbal remedies for dogs, cats at: http://petsherbalhealthguides.com/. You can also download our free health guides in pdf format that you can read on your browser, or save them on your computer, they are free of malware, viruses, worms, and spyware. You can find them here: http://petsherbalhealthguides.com/category/health-guides/. Microchipping pets has been a hot topic in the news lately with the Pharmaceutical company Merck being served a lawsuit over claims its pet microchip product HomeAgain® induced cancer in a cat. More details on this case can be read here: Andrea Rutherford v. Merck Sharp & Dohme Corp. and Digital Angel, Inc.
A microchip implant is an identifying integrated circuit placed under the skin of a pet that is about the size of a large grain of rice. The microchips are based on a passive RFID (Radio Frequency Identification) technology which allows them to be scanned using a handheld scanner. The FDA's official statement is as follows "The potential risks to health associated with the device are: adverse tissue reaction; migration of implanted transponder; compromised information security; failure of implanted transponder; failure of inserter; failure of electronic scanner; electromagnetic interference; electrical hazards; magnetic resonance imaging incompatibility; and needle stick." The American Medical Association's (AMA) Council on Ethical and Judicial Affairs' (CEJA) 2007 report, entitled "Radio Frequency ID Devices in Humans," says microchip implants "may pose some physical risks, compromise patient privacy, or present other social hazards." While complications and reports over microchipping pets appears to be rare, we would be interested in hearing our readers direct experiences with chipping their own pets if they have done so. For those of you with Labrador Retriever puppies that are thinking about using training pads, Hartz is offering free samples on their Facebook page. "Hartz® Home Protection™ Training Pads are now 75% more absorbent* to provide 12 hours of protection. Our unique Flash-Dry® technology prevents leaking and tracking to ensure your home is as clean as you left it. Hartz® Home Protection™ Training Pads also contain an antimicrobial to eliminate odor causing bacteria and have a built-in attractant to help make training easy." If you would like to receive a free sample of Hartz Home Protection Training Pads, head on over to the Hartz Facebook page and "Like" them to make your request. My Dog Eat Grass, is this OK? As I said earlier, many dogs will eat grass to make themselves vomit, but if your dog is doing this on a frequent basis it’s a sign that her system may be off kilter. In this case, you absolutely need to reevaluate their diet, as frequent gastrointestinal upset is a sign that something is wrong with the food that you’re feeding. It may be a great quality food, one your dog has been eating for years with no trouble. But if your dog begins vomiting up grass and food several times a week or even weekly, I can tell you that this is not normal. I would recommend switching brands of food, switching flavors and switching protein sources. Above all, if you’re capable of going from an entirely dead diet (kibble or canned) to an entirely living diet (raw), that would be wonderful! You may want to seek the help of a holistic veterinarian who can help you to switch your dog to a new diet. Most importantly, if your dog has been eating the same diet for most of his life, you will need to make the transition gradually. Contrast the first scenario -- your dog rushing out and eating any and all grass in sight -- with this second scenario: you let your dog out the back door. It looks like he’s having a great time running around when all of a sudden you see him on a mission. He is sniffing and specifically seeking out tall, broad grasses -- the tall grasses that typically grow along a fence line or up from sidewalk cracks. Your dog is very selectively picking out certain grasses. He identifies them and uses his front teeth to nibble and eat them. He’s not frantic, he is doing it almost with intention and you see him select a few grasses and go about his way. That’s an entirely different scenario and that’s scenario number two, which means your dog is eating grass because he wants to. Dogs know what they need to consume. And in fact, biologists have told us that all canids -- dogs and wild dogs (wolves, coyotes, dingoes, etc.) -- consume grass and it’s a completely normal behavior. And again, there’s nothing wrong with letting dogs do that. So, that’s my official response. If you’re interested in participating in this hotly discussed topic, join us in the MercolaHealthyPets.com forum. I hope to see you there! You will need some good tips for training a Labrador puppy, if you have made the decision to bring one of these bundles of joy into your life. Or perhaps you already own a Labrador. Do you know how to go about training your new puppy? It's a great idea to arm yourself with some information before you start, so that you get the absolute maximum benefits out of your training program, and thus fast track your results for a well behaved dog. What sort of training program will you choose? Who will train the puppy? To train a Labrador puppy will require persistence, patience and perseverance. It doesn't happen over night, but once your new puppy has learnt the lessons you want him or her to learn, your life together will one of many happy moments. 1. Be kind and gentle. Your puppy is a baby, who doesn't know right from wrong. It's up to you to show him or her the correct way to behave. Smacking your pup, will only have adverse effects. It will make your puppy rebel. Positive reinforcement is the only method you should engage in. Praise your puppy when he/she does the right thing. 2. Make the lessons short. Your puppy will have a very short attention span at first, and introducing new things to will tire him/her quickly. Make the lesson no longer than say 5 minutes, 3 or 4 times per day. This is quite enough for your pup to get the hang of the new behavior - especially when you reward him/her with a treat for doing the right thing. Do not give a treat, if you don't get the correct response. 3. Spend time with your puppy. You and your family are your puppies new "pack". Dogs are pack animals and are not happy being left alone. If left alone Labradors can bore easily and become quite destructive. Plenty of chewing toys are a great idea for those first teeth, and as he/she gets older, lots of bones will keep your Lab amused. As cute as Labrador puppies are they can be disobedient, unresponsive, boisterous and just generally difficult to manage if they are not taught the right ways to behave. Do you dream of having an obedient puppy? You know you can have complete control over your Labrador Retriever puppy, and never feel embarrassed by their behavior again. To train your Labrador pup correctly the first time, get your step by step guide and DVD on how to train a Labrador Retriever and put an end to any bad habit your puppy may have right now: Go to Labrador Retriever Training Info. "Mutt Mitts are designed to protect you and the environment. As a dog owner, we urge you to take steps to reduce your dog’s "carbon paw print", and to find earth friendly pet products that are healthy for your dog and the environment. Inspire others to be environmentally responsible dog owners, and to advocate for more dog friendly spaces in our communities. The idea of the Mutt Mitt originated when a park employee was observed picking up dog waste in preparation for an outdoor event. Our inventor thought "there should be a better way to do that. ", and hence Mutt Mitts were born." To get your Free sample of Mutt Mitt Bags which are used by more than 5,000 parks nationwide, visit their Facebook page and "LIKE" them to make your request. "The Real Dogs of America is a group dedicated to recognizing and celebrating the new breed - Real Dogs - in their stick - chewing, mud-tracking squirrel-chasing glory. From the greatest Dane to the tiniest Terrier, dogs everywhere want to join the pack." Is your Labrador Retriever ready to join the pack? Join the Real Dogs of America sponsored by Aplo and get a free membership kit. Register your best friend in Real Dogs of America and they'll strut proud as a card-carrying common sense canine. 'Real Dogs Eat Meat' Hanbook... and more. Good only in U.S.A., A.P.O. 's, F.P.O.'s. While supplies last. Limit one per household"
We had the Free Sample of Alpo Prime Cuts posted on 5/13, this is a new link from the Alpo Facebook page. To get your free sample of Alpo Prime Cuts, you have to "LIKE" Alpo on Facebook and then click on the image of the Alpo can. For those of you in New York City or or close surrounding areas, the ASPCA is hosting Brooklyn block party and you’re all invited. On Saturday, May 21, 2011, 10:00 A.M. to 4:00 P.M. (rain or shine) the ASPCA is hosting a block party with free spay/neuter, microchipping, vaccination services and much more. This is a wonderful way to help save some money with the high cost of veterinarian fees. The ASPCA Brooklyn Block Party will be held in Sunset Park, Brooklyn (56th Street between 5th and 6th Ave). Arrive by 7:00 A.M. for spay/neuter services! Get a free sample of Alpo Prime Cuts from Walamrt. To get your Free Alpo Prime Cuts Sample, click on the second bubble and then "Get a Free Sample." PETCO is sponsoring the Healthy 5 Sweepstakes where the Grand Prize winner will receive one $5,000 American Express Gift Card, one $500 PETCO Gift Card and one 1-year supply of Innova Natural Pet Food. They are also offering great second and third place prizes of American Express Gift Cards, PETCO Gift Cards and supplies of Innova Natural Pet Food. Wonderful prizes that would give us Labrador Retriever owners some extra toys and treats for our Labrador Retrievers (plus a little something for ourselves) and a really good dog food! 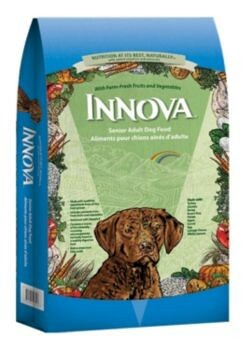 "Innova was the first true holistic health food for pets. Every dog food and treat in their line is made with farm-fresh, natural ingredients from the five food groups to supply optimal nutrition for peak performance at every life stage. Ingredients like protein-rich chicken, turkey and beef, calcium-packed cottage cheese, and wholesome fruits, vegetables and grains - all providing the essential vitamins and minerals your pet's lifestyle demands. Plus, essential fats and oils are added to improve your dog's skin and coat while reducing allergies and improving his immune system. No other pet food supplies so much natural nutrition in a pet food your dog will actually eat – and enjoy!" The PETCO Healthy 5 Sweepstakes is open to residents of the USA and ends May 27, 2011 (11:59pm PDT). Whether you’re gearing up for a family vacation or making a move, traveling with your dog can be both fun and challenging. It definitely isn’t the easiest thing in the world to do, but with a little planning and forethought, you can make the trip exciting and fun for you both! Just like traveling with kids, you’re going to have to stop for plenty of bathroom breaks. Make sure you have a leash in easy reach, as you won’t always be lucky enough to stop right next to a fenced park. A brisk walk, game of fetch, or just some plain old running around will help them stretch their legs and get rid of any built-up energy. Bring collapsible bowls for both food and water. Also ensure that you take along a lot of dog waste bags so you’re able to clean up after them at each rest stop or in case your stops don’t have designated pet waste stations. 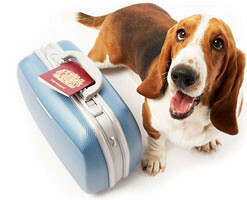 First and foremost, check with your airline to familiarize yourself with their pet travel policies. Small dogs (under 15 pounds) may be allowed to travel crated in the cabin, but any dog over 15 pounds will be in the cargo area. Your furry flight companion’s crate should be sturdy, well padded, ventilated on three sides and large enough for them to turn around in. If you choose to sedate the dog, be sure to consult your veterinarian. Do not feed your dog for six hours prior to the flight, but provide water in an attachable dish in the crate. Direct flights at off-peak hours are ideal, as take-off and landing only occur once and airline staff will have more time to properly care for your dog. 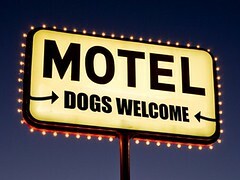 When staying at a pet-friendly hotel, a little bit of home goes a long way to making your dog more comfortable. Bring their favorite blanket, usual food and water bowls and a few toys. You may want to bring a throw or blanket to protect the hotel’s bedding from muddy or dirty paws if your dog sleeps in the bed. If they are crated at home, it is a good idea to crate them in the hotel room as well. Finally, turning the television on at a low volume while you are gone can help discourage barking, as it covers background noise. Most importantly, remember that dogs can feel most uncomfortable when their routine is broken, or when they don’t know what’s coming next so the very best thing you can do for them is to have patience and give them lots of love! Thanks goes out to Kristina for this guest post!! !